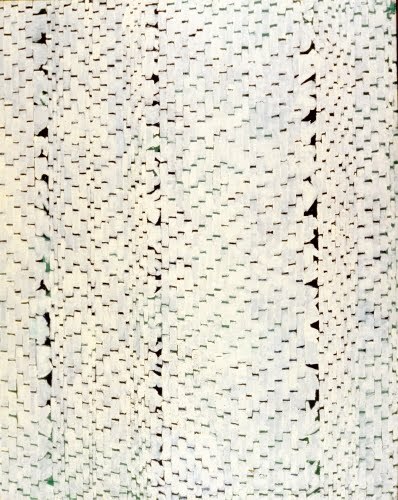 Today my series about the exhibit Two Centuries of Black Art (1976–1977) continues with the work of Alma Woodsey Thomas (1891–1978). She has always been one of my painting heroes. Not only was she an art teacher all of her life, but she also turned to abstraction when she was in her 60s! And the subtle nuances of brilliant color in her paintings are fabulous. Born in Columbus, Georgia, Thomas was the first graduate of Howard University’s newly formed art department in 1924. Howard, founded in 1867, was the first historically black university in the US. After graduation, Thomas taught art to children for thirty-five years in Washington, DC. While teaching, her personal paintings were realistic in style. She exhibited in shows for black artists. In the 1950s Thomas studied painting at American University and became interested in color and abstract art. At the time, Abstract Expressionism, with its emphasis on pure color, dynamic brushwork, and fields of unmodulated pure color, held sway in the art world. Thomas’s interest in color led her to choose Color Field painting, rather than representative works. In 1966, when she was seventy-four, Thomas was offered a one-person show at Howard University. Instead of exhibiting her color field paintings with large, flat areas of color, she decided to exhibit paintings that were in a totally new style. She was fascinated by the leaves outside of her window and the way that sunlight coming through them created endless varieties of pattern and color. Her style of mosaic-like color fields was born. 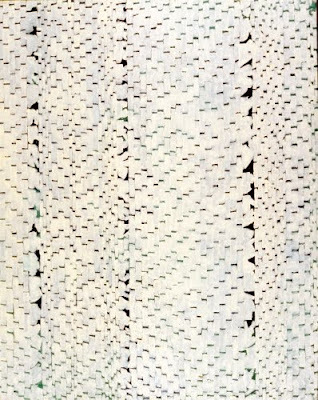 Having started showing in her seventies, Thomas became one of the most exhibited African American artists. Check back tomorrow for my next post in this series, featuring Jacob Lawrence.